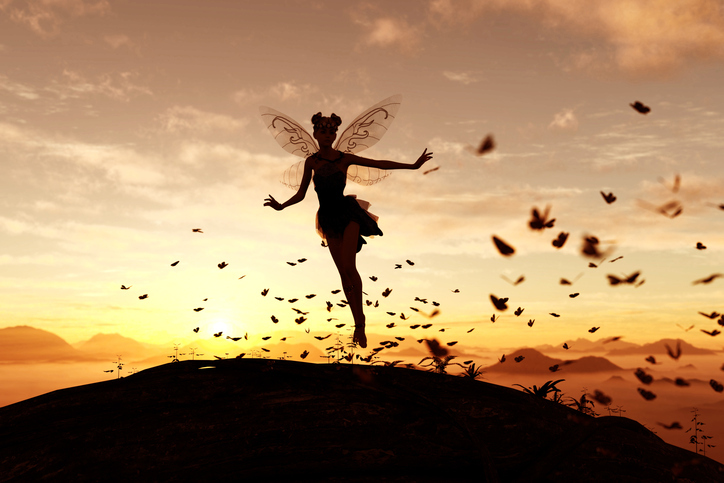 A fairy is an imaginary being, usually in human form, having magical powers. The fairy godmother turned Cinderella's ugly clothes into a beautiful dress. The fairies flew above the sleeping children and sang a magical lullaby. The tooth fairy took Evan's tooth from under his pillow and left a dollar in its place. Fairy tales are usually short stories for children that include magical creatures and often originated as folktales in Europe. Quite often they include enchantments and curses and the characters must find a way to overcome the magic. You can read more about them in Wikipedia. There are other meanings of fairy.